Ergodyne ProFlex 819OD 2X Black Thermal Mechanics Gloves with 500D nylon back and gauntlet cuff provides enhanced long lasting wear and protection. 40g 3M Thinsulate insulated gloves with OutDry breathable windproof and waterproof bonded membrane lessens the liquid penetration. 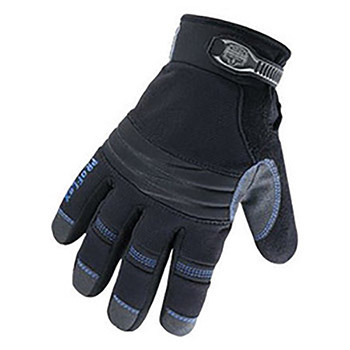 They have PVC coated palm, saddle and fingers which provide magnificent abrasion resistance. Gloves features EVA knuckle pad with reflective dots for added security in dim light condition. EN 420, EN 388: 4223, EN 511: 121 certified gloves features gathered wrist, fortified fingers and terry thumb brow wipe. Full finger patterned gloves with pull tab for easy, quick on and off find application in winter work, outdoor recreation, fishing, marine, fishmongery, construction, ice sculpting and in extreme cold storage.